Mint Cheesecake Bars! 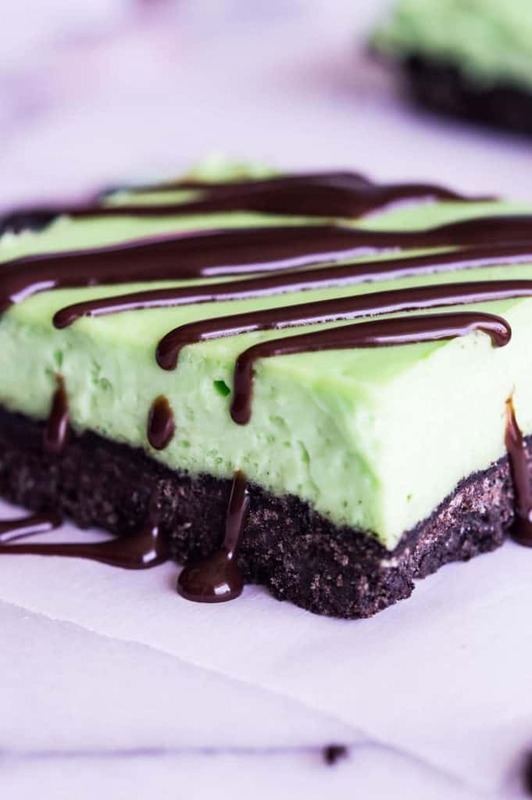 A cool and creamy mint cheesecake baked on top of a mint oreo crust. Drizzle with some extra chocolate for a decadent treat! 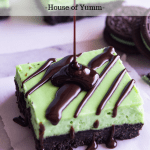 The fun green color makes this dessert perfect for St. Patrick’s Day! Mint Cheesecake Bars! Mint and chocolate are one of my all time favorite combinations. Ever. Add a little cheesecake in there and I might explode from happiness. 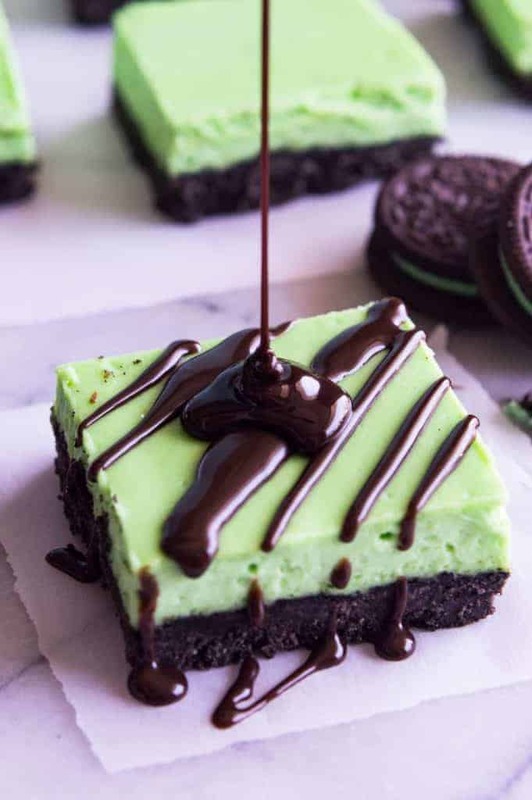 And can we just take a moment to admire the green beauty of these cheesecake bars?? I’m kind of pleased with how the color turned out. 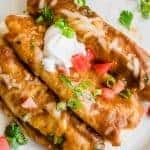 No worries I will share the exact food coloring I used with you down below in the recipe. Just stay tuned. St. Patrick’s Day is coming up. Which makes me feel that all things should be green and mint. Or even just minty. March to me means mint! 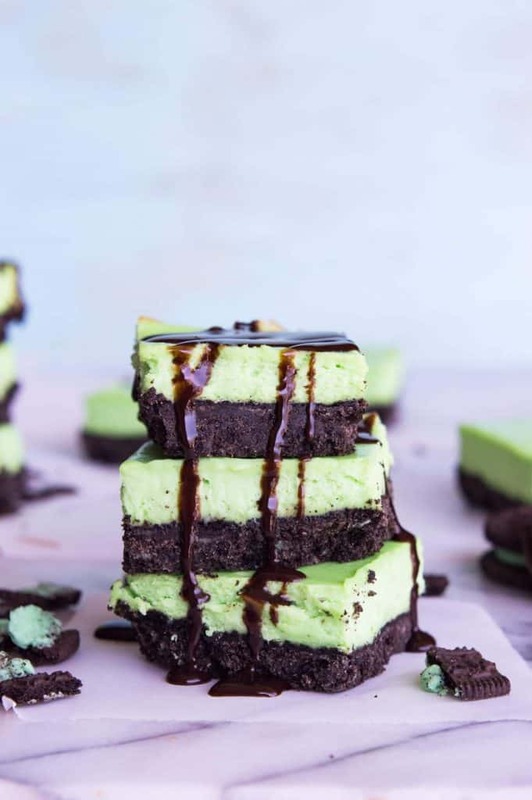 If these Mint Cheesecake Bars don’t do it for you, you can always check out these Jr. Mint Cupcakes, or the Junior Mint Dessert Dip, or toss some of the green food coloring into these Peppermint Patties and they instantly become a little more St. Patrick’s-esque. Personally I think these Mint Cheesecake Bars should satisfy any minty cravings though. The base is made with Mint Oreos, which is just heavenly all on it’s own. Then the creamy cheesecake layer is flavored with some peppermint extract. Giving the entire dessert that perfect cool minty taste. The recipe is based off of the Strawberry Cheesecake Brownies that I made not too long ago. Those bars really reminded me of my love for cheesecake. But seriously..how does a person forget about that?? 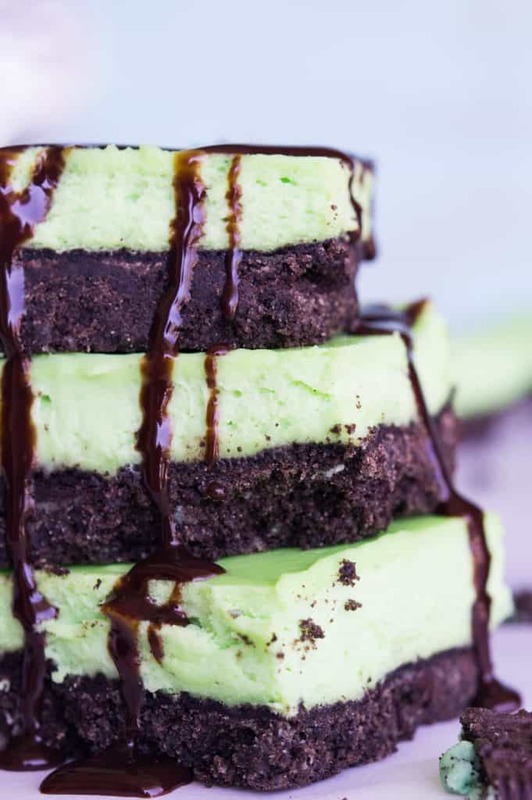 WANT TO TRY THESE MINT CHEESECAKE BARS?! PIN IT to your DESSERT, CHEESECAKE or ST. PATRICK’S DAY Board to SAVE FOR LATER! Preheat oven to 350 degrees. 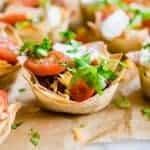 Line a square baking dish with foil or parchment paper, if using foil spray with baking spray. Set aside. 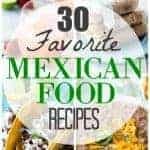 Place the Oreo cookies into a food processor (affiliate link) or blender (the entire cookie, filling and all). Pulse until they become a fine powder, no large chunks. Pour the crushed Oreo cookies into a medium size bowl. Pour the melted butter over the cookie crumbs. Stir until completely mixed. Spoon the cookie crumbs into the prepared baking dish. Using the back of the spoon press the crumbs down in an even layer to form the crust. Bake for 10 minutes. Then remove from oven. Meanwhile, prepare the cheesecake by beating the cream cheese in a medium size mixing bowl on medium speed until smooth and creamy. Add in the sugar, egg and egg yolk, and peppermint extract. Mix on medium speed until fully mixed. Mixture should be smooth with no lumps. Add the green food coloring and mix. Pour the cheesecake over the baked crust. Smooth out using a rubber spatula. Bake for another 20 minutes or until the cheesecake is only slightly wobbly in the very center. 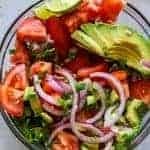 Remove and allow to cool to room temperature. Then place the baking dish in the refrigerator and chill for at least 3 hours prior to cutting and serving. Top with chocolate sauce if desired. Serve and enjoy! Store in refrigerator in a covered container, will last 3-5 days.